The sources on this refer to this girl as a “boxing prodigy,” but this looks way more like some Bruce Lee training stuff than it does any boxing regimen I’ve seen. 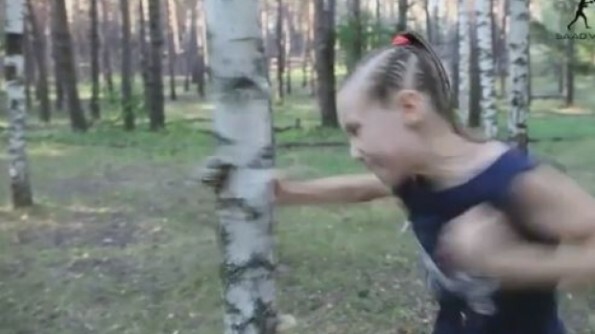 The girl, Evnika Sadvakasov, goes ballistic on a tree using her bare hands, making me wonder if there’s any fallout to her knuckles and skin. In any event, yeah, she’s got some great hand speed and incredible power but this still seems a little…much. Yikes. Don’t piss her off. I’m sure about five minutes after this clip was filmed, that tree was reduced to firewood.